As the years roll on you may be wondering whether or not your CV needs a revamp. In some cases you might even be better off writing a completely new one from scratch – but will it be worth the effort? Making small amendments every time you change job or learn a new skill is a sensible idea. It keeps your CV up to date and ready for action if the time comes to look for a new job. But what if it’s time to start again, and how will you know if writing a new CV is the right thing to do? Have you recently been applying for lots of jobs only to hear nothing back from the employer? If this sounds familiar then it could be a clear indication that it’s time to start again with your CV. From your perspective it could be very hard to pinpoint exactly what’s going wrong, but from the list above you should be able to make a start at trying to discover the failings of your CV. Sometimes it could just be the one small error that’s letting you down, and when considering how to resolve this issue we would recommend starting again from scratch. Not only will that give you a very good chance of eliminating any mistakes, it will also keep your CV looking modern and up to date. Top tip: There are two ways you can help prevent the constant rejection of your CV. Firstly, use a CV template from a trusted and respected website that specialise in the creation of professional and career orientated templates. Secondly, have a professional proofread your CV to find out what could be going wrong. Look for someone who has extensive experience in hiring and reading CVs who could offer you the very best advice on the look and contents of your CV. In such a fierce competitive job market it will pay dividends to keep your CV up to date, modern and in-line with what an employer is expecting to see. Candidates and employers are no longer settling for the standard two page black and white CV, and using a little colour and a more creative layout is fast becoming normal practice. If you’ve had your current CV for many years, it’s guaranteed to be out of date and showing its age. Rather than transfer your details over to a shiny new CV template, you should also write a brand new CV to ensure it includes all of your recent activities – promotions, new skills, qualifications, work experience, achievements, and performance. When up against so many other candidates that have the same or even more qualifications than you, the only way to stand out from the crowd is to cover every possible angle. You can only achieve this by writing a brand new CV using a modern template. Changing career is a hard thing to do, but could just be the best decision you’ve ever made. If you’re considering a career change then writing a new CV is a must. Your old CV will be littered with work experience and accolades that are likely to be irrelevant to the new career, so a complete overhaul is needed. This doesn’t of course mean to say that everything you’ve achieved so far is irrelevant but rather, you might need to rethink how it is displayed on your CV. When writing a new CV you need to consider what transferable skills you have in relation to the new role and how you can highlight to an employer what you have to offer. You cannot amend the past, but what you can do is move forward and recognise what a new employer in a different industry would want to see. Stay positive throughout your new CV and only focus on what you can do rather than what you can’t. Adunola Adeshola, Contributor to ForbesWomen, cites failing to focus on the new position as one of the reason people fail to get an interview. 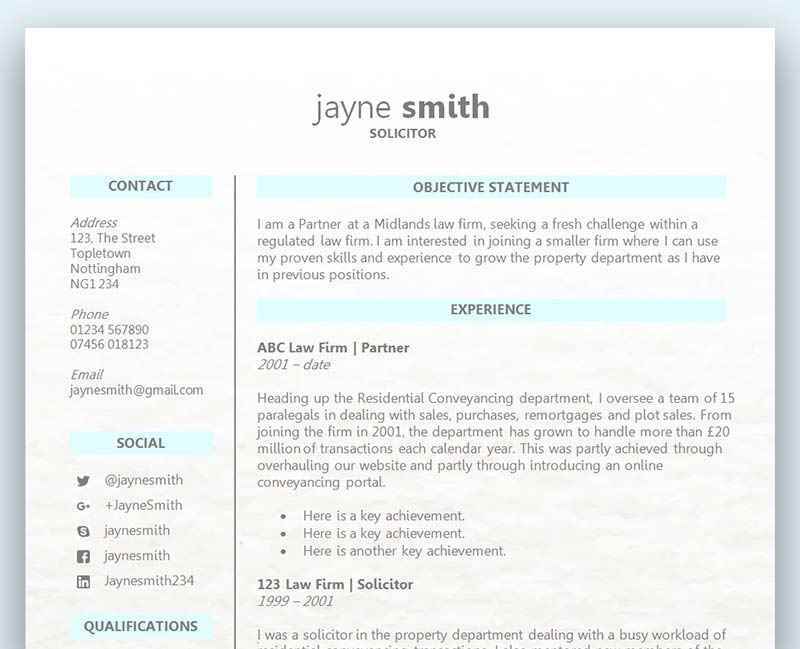 Above: ‘Connect’ CV template (scroll down on the template page for this alternative version). Can’t see one that you like? Check out our free professional CV template collection. What is the correct CV layout? Are there any benefits to taking a gap year?